According to a major health survey, nearly half of all Americans have been mentally ill at some point in their lives - more than a quarter in the last year. Can this be true? What exactly does it mean, anyway? What's a disorder, and what's just a struggle with real life? 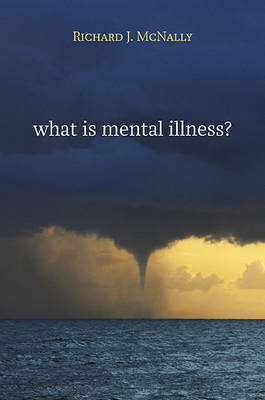 This lucid and incisive book cuts through both professional jargon and polemical hot air, to describe the intense political and intellectual struggles over what counts as a 'real' disorder, and what goes into the 'DSM', the psychiatric bible. Is schizophrenia a disorder? Absolutely. Is homosexuality? It was - till gay rights activists drove it out of the DSM a generation ago. What about new and controversial diagnoses? Is 'social anxiety disorder' a way of saying that it's sick to be shy, or 'female sexual arousal disorder' that it's sick to be tired? An advisor to the DSM, but also a fierce critic of exaggerated overuse, McNally defends the careful approach of describing disorders by patterns of symptoms that can be seen, and illustrates how often the system medicalizes everyday emotional life. Neuroscience, genetics, and evolutionary psychology may illuminate the biological bases of mental illness, but at this point, McNally argues, no science can draw a bright line between disorder and distress. In a pragmatic and humane conclusion, he offers questions for patients and professionals alike to help understand, and cope with, the sorrows and psychopathologies of everyday life.